The owners of one of San Antonio’s grandest estates in a long-established suburb bid adieu several years ago to the excitement of an urban Manhattan lifestyle. With the arrival of their first child, they sought a more conventional way of life than the hustle and bustle New York City offered. No insignificant factor in the decision was the 1993 bombing of the World Trade Center. (Incidentally, her husband’s office was moved back into the WTC following reconstruction after the 1993 event, but all his former co-workers made a safe exit after the horrendous 2001 WTC attack.) After settling in the Alamo City, the family of three grew to five, and four years ago they purchased their current home —­ a Georgian estate designed in the 1930s by noted 20th-century architect Attlee B. Ayres. It was not until the early 1950s that the house was actually built, according to the mistress of the home. “The war (World War II) came along, and construction was delayed,” she explains. Though the home is Georgian in basic design, a distinct nod to the 20th century and specifically the 1950s is evident both within and without. As for the quality and integrity of construction, it is so exemplary that the homeowner’s friend and local architect, Patrick Chumney of Chumney and Associates, recalls one of his University of Texas classes in the School of Architecture journeyed from Austin to see the house while it was under construction. It is built on a reinforced concrete frame, and the foundation is the same as that used in commercial construction — a suspended concrete slab on drilled piers, notes Chumney. “It will be there forever,” he adds. Woodwork in the home is elaborate and exquisite. The crown molding, baseboards, door surrounds, mantels and floor-to-ceiling columns flanking great window expanses reflect the Georgian influence. 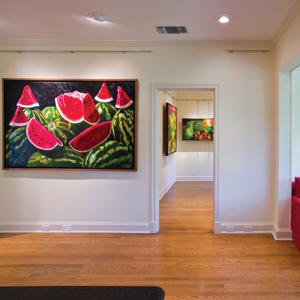 The entry hall with dark oak floors and walnut threshold insets holds panels painted by a California artist with airy scenes including towering topiaries, birds and other wildlife. Two elongated gilded marble-top tables were commissioned for the room by the original owner. Flanking the doorway are massive Empire planters carved with acanthus leaves. 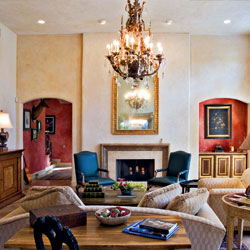 The formal living room walls were a “dark, dark, dark magenta — almost a red-black color,” mentions the owner. They are now a faux-finish sunny yellow. Previous owners removed heavy drapery at massive windows on the first floor, and the main living areas look to a glorious vista of rolling lawns and an arbor of trees planted more than 50 years ago — trees that, by the circumference of their trunks, look decades older. Wall-to-wall carpeting was originally placed through most of the home. “In older homes, you can often find wonderful floors under carpets, but we weren’t so lucky. It was all concrete,” the homeowner explains. However, between the immediate past owners and the current owners, wall-to-wall carpeting is history. It was replaced with cream marble with dark green veins and the reverse — dark green marble with cream accents. Many of the furnishings in the living room and other rooms throughout the house were purchased from the previous owners, who downsized in a move out of state. Coming from a Manhattan apartment, “we were so lucky to purchase what was here. In this house, our dining room table would have looked like a card table,” says the owner with a smile. Creating intimate settings has been one answer to the dilemma of making expansive spaces warm and inviting. She credits her friend, artist Elizabeth Ridenhower, with help in placing furniture in the house, including the three separate but cozy seating areas in the formal living space. “She can arrange furniture like no one I have ever met, except my grandmother,” smiles an appreciative friend. One of her favorite pieces in the living room is a Victorian black tilt-top table with inlaid shells. “I like black against the yellow in the room,” says the home’s mistress. Other important furnishings include a tole tray from a former home in Australia. A custom wrought iron base has converted it to a coffee table. Another remembrance of Australia is a painting of Sydney Harbor by Eve Hannah. It is a view the owners enjoyed from their home. Nearby is a watercolor collage by Bettie Ward. Another treasure is a painting from the homeowner’s grandparents’ Houston home. The scene, by Henri Gadbois, is purported to be that city’s tree-lined Post Oak Road of long ago. Side chairs near a secretary are an inexpensive early-marriage acquisition from a “junky Manhattan shop,” the owner explains. The chairs, covered with many layers of paint, were refinished by the couple. “They are very old, and I think we really got a deal when we bought them,” the owner delights. A more informal living space is known as the bridge, or garden, room. It was the scene of the original owner’s regular gathering of friends for bridge. Walls are a vanilla hue, and furnishings are airy in fabric and design. Audubon prints adorn the walls, apropos the room’s atmosphere. Bookcases are built into the room at approximately every other panel. Panels between the open-shelved units conceal more storage. A mounted wild boar “graces” one wall, the spoils of a South Texas hunting trip taken by the owner and his eldest son, who was but a wee lad of two at the time. The formal dining room and a spacious breakfast room are accessed through an area which could be likened to a receiving parlor. Next to the entry, it is the location of a winding staircase with a wrought iron balustrade — one of the “nods” to the 1950s. Marble floors were formerly carpeted. The area offers a petite powder room with rich navy blue and gold accents in walls, carpet and furnishings. 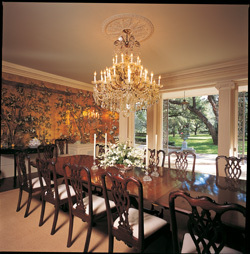 It is centered with a Baccarat crystal chandelier purchased in Round Top by the mistress of the home. The formal dining room table belonged to the previous owner and seats 18 guests. The immense crystal chandelier and a sconce in the room are from an old brownstone home in New York and are believed to have once hung in a Rockefeller home. An artist from Asia was commissioned more than 50 years ago by the original owner to paint Oriental scenes of plants, birds and butterflies on the gold-leaf wallpaper above the dining room chair rail. A French mirrored chest holds heirloom porcelain pieces that belonged to the owner’s grandmother. Near an Italian demilune buffet table is an obscure door which secretes the silver storage room. The nearby breakfast room is octagonal with four shell-shaped cabinet insets, each on the order of a small buffet area. Cabinets are faux-painted green and cream and echo the deep green marble floor, original to the home. Walls are a faux-finish cream color, repeating the subtle hue found in the marble floor veins. A rock planter in front of a massive paned window anchors the room. The remainder of the first floor is much as it was in the mid-20th century. The kitchen in black and white is reminiscent of the era but modern in all aspects. An atrium walkway flanked by ledge rock planters leads to the “bulletproof” family room, smiles the homeowner. With three youngsters aged 12 and under and two active dogs who live indoors, she lauds the rooms for its indestructibility. Floors are a practical 1950s vinyl, albeit in a pattern that cleverly imitates marble floors elsewhere. Furniture is large and comfortable. A pool table and entertainment center are present. They join miniature kitchen appliances belonging to a pre-school daughter. Quite remarkably, the draperies in a hunting print are original to the home and in exceptional condition.